SIM farms and spam offer the greatest threat to A2P messaging. Nearly half of the world’s mobile operators have installed an SMS firewall. And 46 per cent admit they have no idea what impact RCS will have on their A2P revenue. These are just three of the highlight findings from a major new research project that questioned MNOs about the enterprise messaging space. 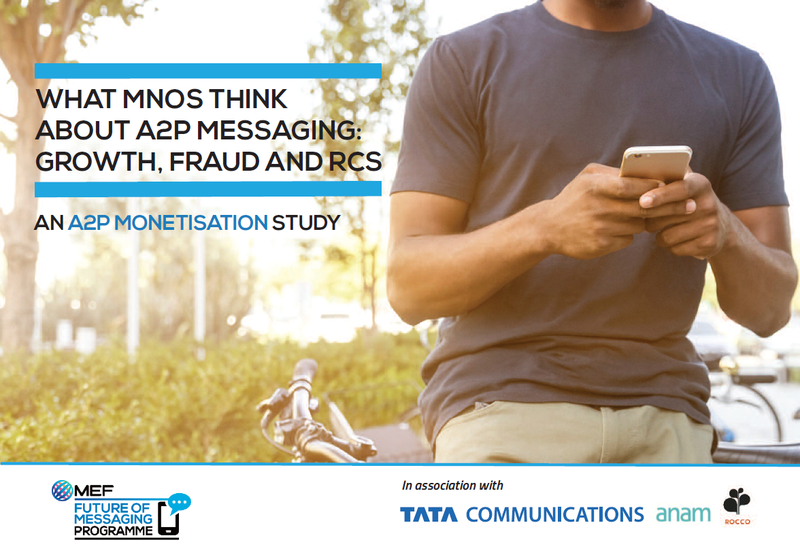 The A2P Monetisation study was conducted by ROCCO Research for MEF in association with Tata Communications and Anam. It is a component of MEF’s Future of Messaging Programme, which aims to promote best practice in the A2P space. The wide-ranging study questioned more than 50 MNOs from all regions in September 2018. The respondents answered questions about fraud, malpractice, regulation, future monetisation and RCS. Their answers revealed the progress the industry has made on tackling some attacks and the need to stay vigilant about future threats. The MNOs differ on how much is being lost to fraud. Some believe it could be as much as 32 per cent of total A2P revenue. However, the average response said 9.4 per cent. Assuming the market to be worth $13.72 billion (source: Mobilesquared), that’s nearly $1.5 billion a year. And what’s causing the leakage? The study revealed that MNOs put spam and SIM farms at the top of their list of current threats, scoring 33 per cent and 20 per cent respectively. Grey routes (18 per cent) and SMiShing (10 per cent) follow next. This study suggests that MNOs have made progress in reducing grey routes and various forms of faking. And this could be because SMS firewalls have blocked many of these workarounds. Indeed, it reveals that 46 per cent of MNOs questioned have installed a firewall. But MNOs don’t just expect technology to attack the problem of fraud and industry malpractice. The survey also revealed strong support for self-regulation. It showed that globally more than half of MNOs support the introduction of an MNO-led code of conduct (54 per cent) or an SMS aggregator-led code (50 per cent). Needless to say, MEF is already making progress on this via its own code of conduct, which was launched in the summer with the 30 plus members of its Future of Messaging Programme. Such defences are necessary because – for the most part – MNOs are optimistic about the future of A2M messaging. The study found that 54 per cent of MNOs are actively growing their (enterprise) customer bases to boost A2P revenue. But do they see RCS as the driver of this? The answer is unclear. On the plus side, fewer than eight per cent of MNOs believe RCS will be more prone to fraud than SMS. But then again 43 per cent concided they have no idea how RCS will impact their A2P revenues. Joanne Lacey, MEF’s CEO , said the study offers a valuable snapshot of how operators feel about enterprise messaging in 2018.